For many industries, composites are the material of choice for achieving lightweight, fuel-efficient and strong designs. The challenge going forward for engineers is to take full advantage of the properties of composites by using advanced analysis tools to predict margins of safety, performance, cost, and design for manufacturability (DFM) without adding unneeded weight at each juncture of the engineering design creation and review process. 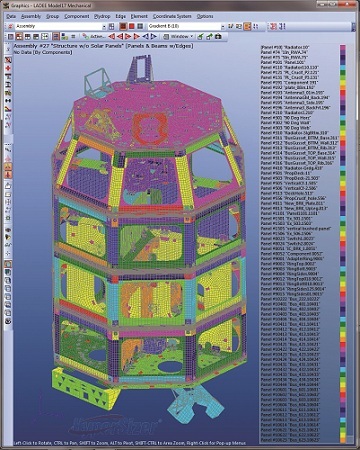 HyperSizer v6.2 software from Collier Research Corp. (Newport News, VA) is used widely in the spacecraft and aviation industries and includes new modeling capabilities for airframe wing box designs as well as laminate zone and ply-count optimization enhancements to improve manufacturing efficiency. HyperSizer’s capabilities are also appropriate for applications in wind turbine blades, ship hull and superstructures, high-speed railcars, and automobile body components, helping teams move from conceptual design studies through to final validation for aerospace, wind, shipbuilding, railroad and automotive composite applications. To overcome such drawbacks, HyperSizer targets weight while serving as an independent and neutral data exchange hub for CAD, FEA, and composite software packages. It iterates with FEA solvers, calculates margins of safety, validates failure predictions with test data, and sequences composite laminates for fabrication—avoiding weight growth as designs mature. HyperSizer has been used on a wide variety of NASA spacecraft projects including the current Space Launch System (SLS) rocket, previous Ares I and V launch vehicles, the Composite Crew Module, and the metal Orion Multi-Purpose Crew Vehicle. Commercial aviation customers include Boeing, Bombardier, Goodrich, Gulfstream, and Lockheed Martin. Discrete Stiffener Modeling—For airframe wing box and fuselage structures, the software automatically identifies in the FEM, skin shell and stiffener beam elements and optimizes their spacings, heights, and laminates. Laminate Optimization for Manufacturability—An improved, six-step process optimizes laminates (transition zones, ply-count compatibility, ply drops/adds, global ply tracking) while balancing strength, stability, and manufacturability. This leads to fabrication efficiencies and factory-floor cost-savings.